Janice Light, Ph.D., is a Distinguished Professor in the Department of Communication Sciences and Disorders at Penn State University. Her primary area of expertise is augmentative and alternative communication (AAC). AAC is a relatively new field of research and clinical practice that is directed toward improving the quality of life for individuals who have complex communication needs including those with developmental disabilities (e.g., autism, cerebral palsy, Down syndrome), those with acquired neurogenic disorders (e.g., traumatic brain injury, stroke), and those with degenerative neurological conditions (e.g., ALS, muscular dystrophy). Dr. Light is actively involved in several federally-funded research grants designed to build the communicative competence and improve the quality of life for individuals who have complex communication needs through the use of augmentative and alternative communication (e.g., signs, communication books, computer-based assistive technologies). She is especially interested in strategies to enhance language and literacy development with children with autism, cerebral palsy, Down syndrome and other special needs. Dr. Light is a project director for the Augmentative and Alternative Communication Rehabilitation Engineering Research Center (The AAC-RERC), a virtual research consortium that is funded by the National Institute on Disability and Rehabilitation Research. Dr. Light's research contributions are well recognized nationally and internationally; she has published more than 65 papers in leading peer-reviewed journals and has presented more than 125 peer-reviewed papers at national and international conferences. She is the author, with Dr. David McNaughton, of an evidence-based literacy curriculum for students with complex communication needs, entitled Accessible Literacy Learning: Evidence-based reading instruction for individuals with autism, cerebral palsy, Down syndrome and other disabilities. 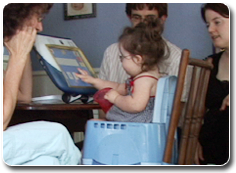 In 1996, Dr. Light was recognized as the Don Johnston Distinguished Lecturer by the International Society for Augmentative and Alternative Communication for her leadership in the AAC field. In 1999, she received the Dorothy Jones Barnes Outstanding Teaching Award: and in 2001, she was inducted into the Penn State Teaching Hall of Fame. She has also received several awards in recognition of her research and scholarship: in 2002, she received the Helen G. and Evan G. Patishall Outstanding Research Achievement Award; in 2006, she received the Pauline Schmitt Russell Distinguished Research Career Award; and in 2008, she received the Penn State University Faculty Scholar Medal in the Social and Behavioral Science in recognition of her research accomplishments. This early intervention program was developed and evaluated through a research grant (#H133E030018) funded by the National Institute on Disability and Rehabilitation Research (NIDRR) as part of the AAC-RERC. The contents do not necessarily represent the policy of NIDRR.